Who Makes Fuels from Sunlight? Discover semiconductors made from Earth-abundant elements that can convert the energy in sunlight into the potential energy of separated charge carriers of opposite sign (i.e. electrons and holes). We use a variety of methods such as single-crystal growth, sputtering, and solution chemistry to synthesize new semiconductors and semiconductors that have not yet reached technological importance. We are looking for materials that are made of Earth-abundant elements, that can be synthesized inexpensively, and that are inherently stable under application-specific operating conditions. 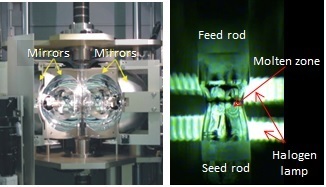 We apply a variety of spectroscopic, electrochemical, and solid-state electronic techniques to: study the conversion of light to separated positive and negative charge carriers; study the dynamics and fate of those carriers within semiconductors; determine the density of dopants and trap states; determine crystal properties such as phase and grain orientation. Transition-metal dichalcogenides (TMDCs or MX2s, where M is Mo, or W and X is S, Se, or Te) are semiconductors with band-gap energies of interest for photovoltaic and photoelectrosynthetic applications. Specifically, MX2s have band gaps of 1.0 – 1.5 eV (indirect) and 1.4 – 2.3 eV (direct). MX2s are layered materials consisting of two-dimensional sheets held together by van Der Waals forces. In the Lewis group, we use a chemical-vapor-transport technique to grow single crystals of p-type or n-type MX2s. The p-type MX2s are candidates for photocathodes in photoelectrosynthetic cells. n-Type MX2s have been studied extensively for photoanodes for halide oxidation; however integration of MX2s into devices has been hindered historically by the inability to reproducibly synthesize photoactive forms of these materials on a large scale. MX2s are particularly interesting materials because they are not only light-absorbing semiconductors, but also possess inherent catalytic activity for the reduction of water to hydrogen fuel. Crystalline edge sites have been shown as the active sites for water reduction in acid, however edge sites typically are associated with recombination of charge carriers in a semiconductor (i.e., loss of efficiency). We applied spatially resolved in situ electrochemical techniques to study the dependence of photoconversion efficiency on edge and terrace sites.2 The measurements showed significant differences in the charge-carrier-collection performance among terraces. 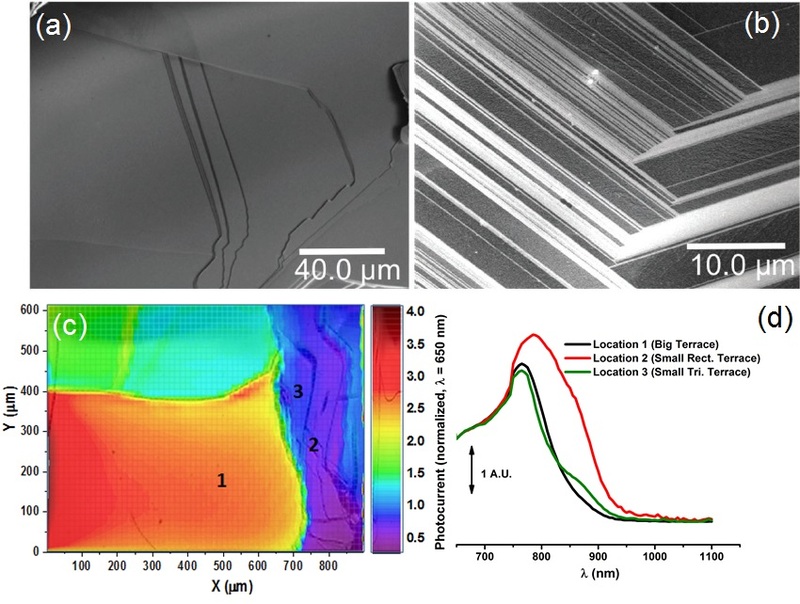 Local spectral response measurements showed variation in the local electronic structure among the terraces, consistent with a non-uniform spatial distribution of sub-band-gap absorption within the crystals. 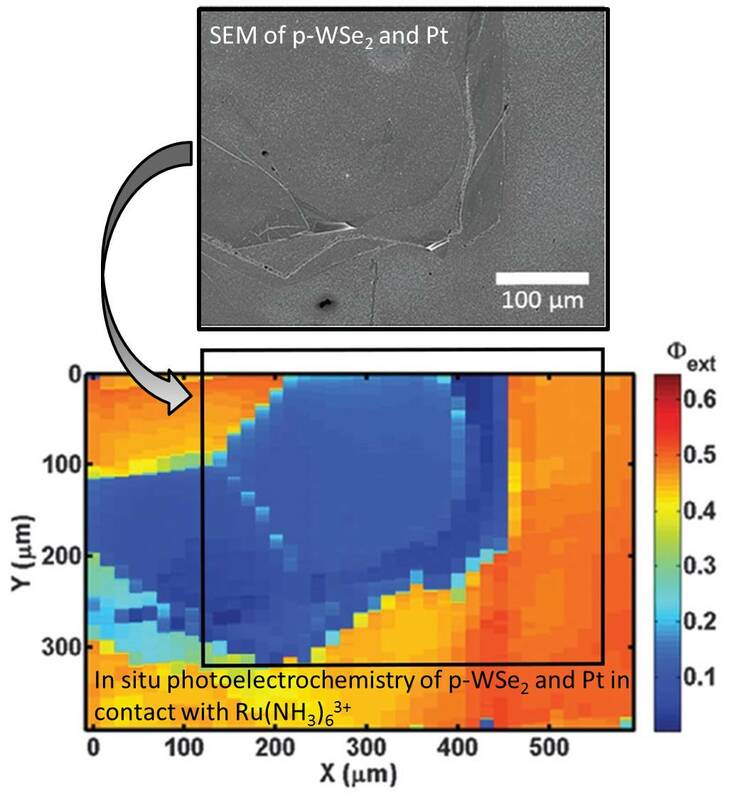 Scanning tunneling microscopy showed defects resulting from selenium vacancies distributed on the surface of p-WSe2. Although some effects of edges were observed in this work, the effects differed among edges, and did not seem to determine the performance of the electrode. Therefore, identifying and eliminating the cause of low-performing terraces could lead to MX2 photoelectrodes with uniformly high performance. Photo courtesy of Stefan T. Omelchenko. Velazquez, J. M.; John, J.; Esposito, D. V.; Pieterick, A.; Pala, R.; Sun, G.; Zhou, X.; Huang, Z.; Ardo, S.; Soriaga, M. P.; Brunschwig, B. S.; Lewis, N. S., A scanning probe investigation of the role of surface motifs in the behavior of p-WSe2 photocathodes. Energy Environ. Sci. 2016, 9, 164-175.
by Kimberly Papadantonakis, June 2016.